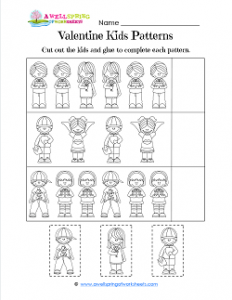 This Valentine kids patterns worksheet has some adorable kids on it. Your kids can look closely at the kids in each row and decide which one comes next. They choose from the three kids at the bottom of the page, cut them out and glue them in at the end of each row. You can talk to the kids about what makes them look like they are ready for Valentine’s Day. It could be a card in hand, kissy lips on their shirt, a gift, a heart, etc. You might want your kids to use their imaginations and discuss with a friend who the kids on the worksheet has a their Valentine.